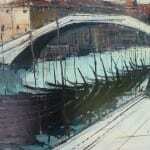 LAZZARI WAS BORN IN 1942 Elio Lazzari is an important Venetian painter. His work is direct and bold. 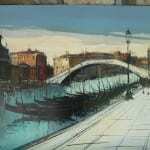 A great colorist who can render the image with the certitude of an experienced master. 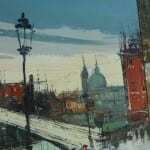 The narrative element of his work is clear and decisive. Lazzari has exhibited extensively. 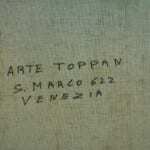 His work is numerous private and public collections in Venice, Rome, Florence, Milan, Torino, and many other Italian cities. 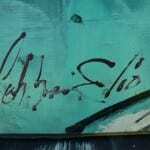 He has also exhibited in Madrid, Barcelona, Cadiz, Paris, New York, Frankfurt, and Luxembourg to name but a few. THIS PAINTING MEASURES 27 1/4 X 35 1/2. 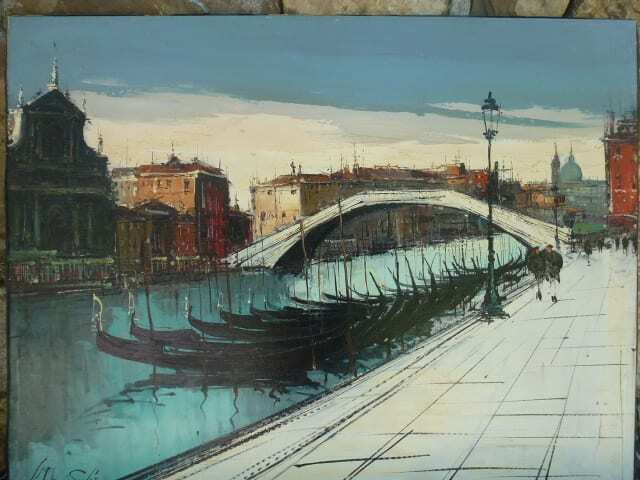 It is clearly of Venice. 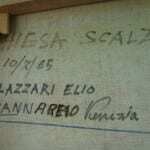 It is signed and on verso reads: Hiesa Scalzi, 10/2/65, Lazzari Elio, Cannabreio Vienezia.